Pooh: "You don't spell it... you feel it." Little Miss A and I have had some fun in the build-up to Valentine's Day with a variety of activities so I thought I'd summarise what we got up. Originally this activity just started as an idea for some letter recognition but it evolved as we were doing it. I taped the letters 'LOVE' onto the floor and then we used our Megablocs bricks to form the letters. We ran out of red bricks so we used some red plastic hearts. Then we ran out of those but I had the idea to use Little Miss A for the missing letter. I love how this photo turned out! 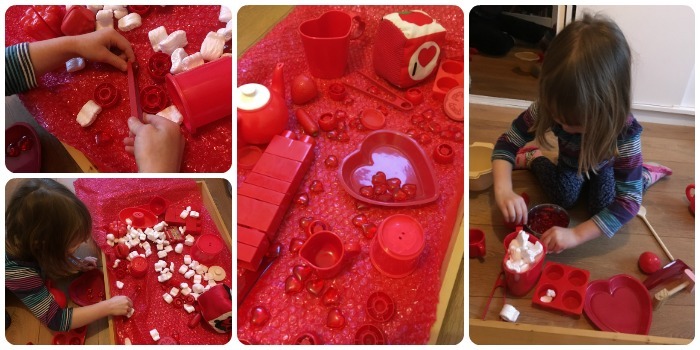 It's been a long time since I've put together some sensory play. 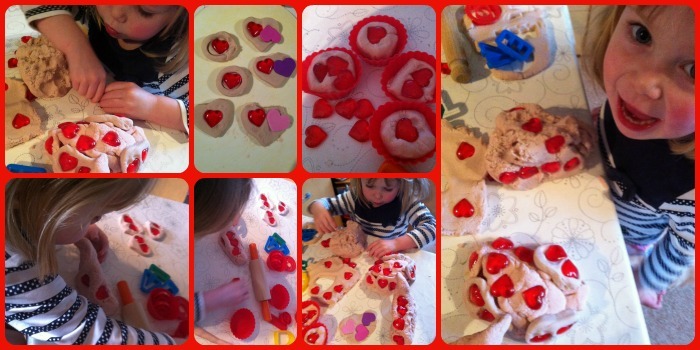 A couple of years ago I did a similar Valentine's Day Themed Play for Little Miss A and used this idea again. Little Miss A was really excited when she saw the tray and got stuck straight in. She loves playing cooking so she immediately started using the small parts as 'ingredients' to make some food. It was fun to watch what she did. Baby R got involved a bit with this but I had to be really cautious as there were some small parts. I separated out the the larger items for him to play with. Little Miss A loves the red plastic hearts and keeps making up other games with them - for instance, she made a trail of them for her Daddy to follow! Inspired by Let's Talk Mommy and her Easy Chocolate Bark, we had a go at making this sweet treat as a present for Mr MoaB. It really is very easy to make and doesn't require any cooking (just a microwave to melt the chocolate). Little Miss A loved doing the sprinkles on top - she was a little heavy handed and they're not very even but that shows it was made by a 3 year old! We have been enjoying reading some 'love' themed books this week. A few of these we had already but I also picked up a few extra on a recent visit to the library. I must admit I cheated and we used a kit which we'd got in the cupboard for this activity (but it was on special offer!). 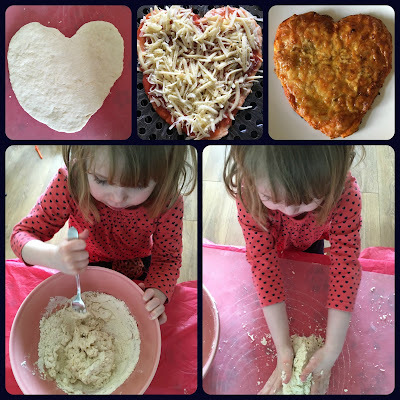 We made heart-shaped pizzas for our lunch on Valentine's Day itself. I'm enjoying getting Little Miss A more involved in the kitchen with food preparation, baking etc. We probably could have been more creative with the toppings but just went with the fail safe cheese & tomato pizza. Next time we'll be more inventive! The play doh consistency wasn't the best as it was homemade, but this didn't stop Little Miss A. As you can see from these pictures and some of our other activities in this post, the plastic love hearts get used a lot! I bought these a couple of years from a Pound Shop so it was £1 well spent! Little Miss A loves painting so we painted some hearts. Something we've done before is use cardboard kitchen roll tubes to make a heart shape and then use this as a stamp. It's so simple, but pretty effective. We also used the plastic insert from a box of chocolates which provided a lot of small hearts in one go. This is how we presented the gift to Daddy. I printed the Love Letters picture as a card for him and we used Little Miss A's painting to cover a heart shaped box I'd saved from chocolates we'd had a previous year. He really was so chuffed with it all. Mr MoaB and I have never really gone in for celebrating Valentine's Day but I must admit it is a lot of fun now we have kids and it's the perfect excuse for lots of themed activities. I'm all for the personal, handmade items rather than shop bought though. Hope you have had a great Valentine's Day whatever you have been up to!